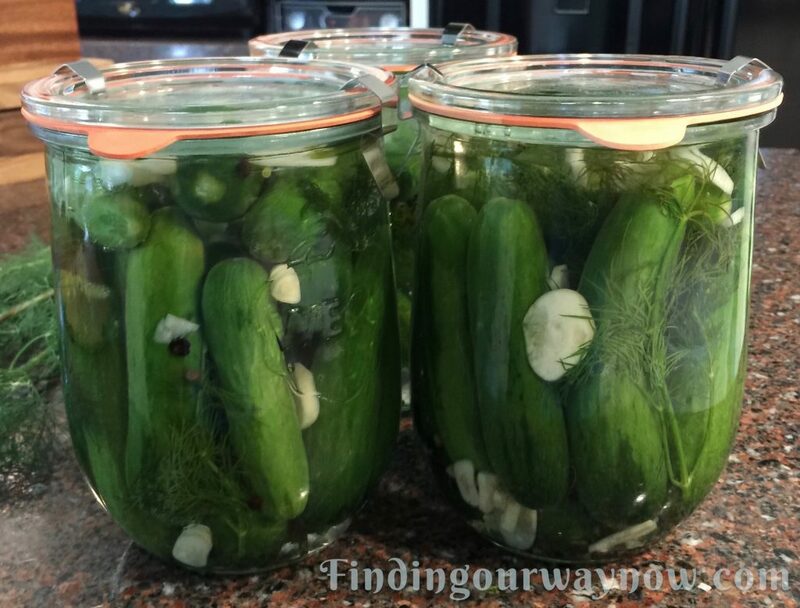 I’d posted this Easy Refrigerator Pickles recipe a very long time ago. While I was making a new batch of pickles, my husband recommended I repost the recipe. You can find some of the most amazing fresh produce at any local farmers market. One of the things I love are the baby cucumbers because they are just so tender, crisp, and so refreshing to eat on a hot summer or early fall day. When I find great cucumbers, I will often make my marinated cucumber salad. That’s when I thought why not make some easy refrigerator pickles? Ingredients: Makes approximately 2 ½ quarts. Clean a 2-quart glass jar or 2 to 3 quart jars thoroughly with hot soapy water or in your dishwasher. Don’t forget to clean the lids too. Combine the water, salt, and vinegar in a saucepan and bring to a boil over medium heat. 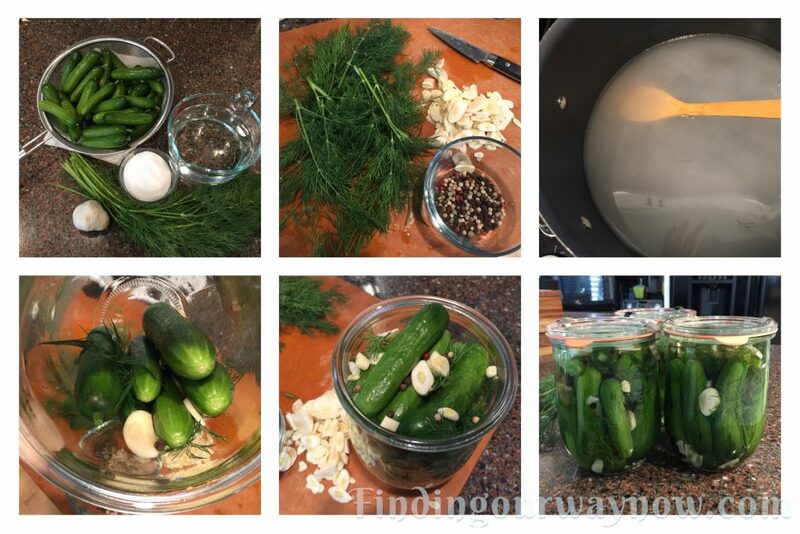 While the mixture is heating, pack the cucumbers with the remaining ingredients in the jars, making sure to intersperse the dill, garlic, and peppercorns throughout. Now pour the hot brine over the packed cucumbers until they’re completely covered. Tighten the lid, allow to cool a bit and refrigerate. Wait 7 days and they’re ready to eat. These pickles will keep in the refrigerator for months. The longer they’re left in the refrigerator, the better they will get. Notes: The ratio of water to vinegar is usually 2 to 1; I used 3 ½ cups instead for less tartness. You’ll have more brine than needed. This is to ensure you have enough to cover the pickles. Only use kosher salt, any other type of salt will not work. Always use young or baby cucumbers. The rinds on more mature cucumbers are tough and a bit bitter which results in a less satisfying result. Make sure to wash and scrub the outside of the cucumbers to remove any dirt. 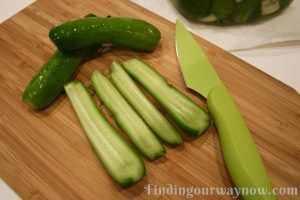 I’ll sometimes remove the stems and ends from the cucumbers to make a prettier looking pickle, but it isn’t necessary. Wasn’t that just the easiest thing? So when you’re at your local farmers market and happen on some great baby cucumbers, buy a bunch and make these awesome easy refrigerator pickles. Your family will love you for it.